I got a few e-mails lately regarding my weekly meals. Some of you pointed out that they would like to see pictures of the meals. Unfortunately, dinner time is usually a bad time for me to take pictures... The toddler is often cranky, hubby just gets home from work, the teenager is preoccupied with his own "stuff"... So I'm not sure how many pictures I'll be able to take and share, but I'll try. While I'm not sure I can share many pictures, I think I'll briefly recap how the meals went the week before, and what worked and what didn't work. Last week, planning what to do with the leftovers was by far the best thing I have done in a long time. I felt so good that we ate and enjoyed all the leftovers. There was a also a slight change in meals as I was busy with "work stuff" Friday afternoon, and we ended up eating at my in-laws. So I didn't experiment with the cabbage salads, which I'll do this week. Thursday: Vegetable fried rice with garlic, onions, carrots, celery, mushrooms, & bell peppers. Questions: What was your favorite meal last week? Why was it your favorite meal? The tomato soup with garlic croutons sound great. My favorite meal last week was carne asada tacos. Mmmm the chicken salad looks awesome! My favorite meal from last week was my spaghetti squash! I love chicken salad! I'm planning on making some for lunch tomorrow! My favorite meal from last week was the dinner out at the Brazillian steak house. Not because it tasted the best, but because it was an experience and we were other with people, so it was very social. As for my favorite meal at home, it would be Sunday night pizza since there is little prep, little clean up and it means we are relaxing and watching movies. BTW I love potato soup, especially with some shredded cheddar on top. Haha--just wanted to mention that I got your kimchi jigae reference. so far this week my sweet potato hash w poached egg is still making me hungry. my food's gotten better with my meal planning! The picture looks great and don't worry, I understand about how taking a picture isn't just a snap and click away sometimes! :) My favorite thing last week was the gruyere cheese bruschetta I recently posted about - it was so good! It seems like you make a lot of Korean meals and have a lot of knowledge about Korean food! It's ok if it's not authentic, I'm sure it'll be tasty :) I don't like the kind with pork anyways. My mom makes hers with anchovy broth. Last week, I enjoyed my mom's soba noodles. We had it in a hot broth with zucchini, kimchi, and nori on top. Total comfort food, and I just love noodles! Oh boy, I can't even remember that far back!! Ok, let's think...homemade pizza! Yes, my friend Michelle made pizza, with whole wheat crust and veggies on top, it was amazing. It was my favorite because it was different from the norm. Love the tomato soup with homemade croutons. I am SO excited for soup season!! Just catching up on your blog... 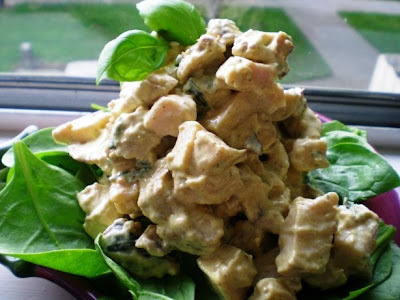 The chicken salad looks good! yay kimchi jiggae! PLEASE try to take a pic of that one! Haha, it doesn't matter if it is authentic or not, because kimchi jiggae is made different in every household! It IS comfort food though! Do you have it with sticky Korean rice? my fave is ALWAYS BREAKFAST. My husband never knows how late he will work so, in a way, our breakfast is most people's dinners. our time together to eat enjoy the food and just BE. My favotie meal last week was brown rice wraps. I just love those things! I hope you share your tomato soup recipe-- I have my own favorite, but I love to see how other people do theirs. I made a lasagna last week that was very tasty! Mmm, chicken salad. We had a bbq, so a really tasty panzanella salad hit the spot! My favorite meal last week was actually from an Italian restaurant. Prosciutto salad with goat cheese. Simple, but oh so delicious.